When you are living in rented property you sometimes aren’t allowed to paint the walls and there might also be times when you just can’t be bothered. The walls in the kid’s room have some really horrible wallpaper on but apparently removing wallpaper is a real pain and it’s just not a job that I can handle doing especially as we don’t own the house. Here are 5 things you can do to brighten up a child’s bedroom wall without doing any painting. Hang up some bunting. I love bunting and it’s a great way to add a personal touch to a room, especially if you make the bunting yourself. 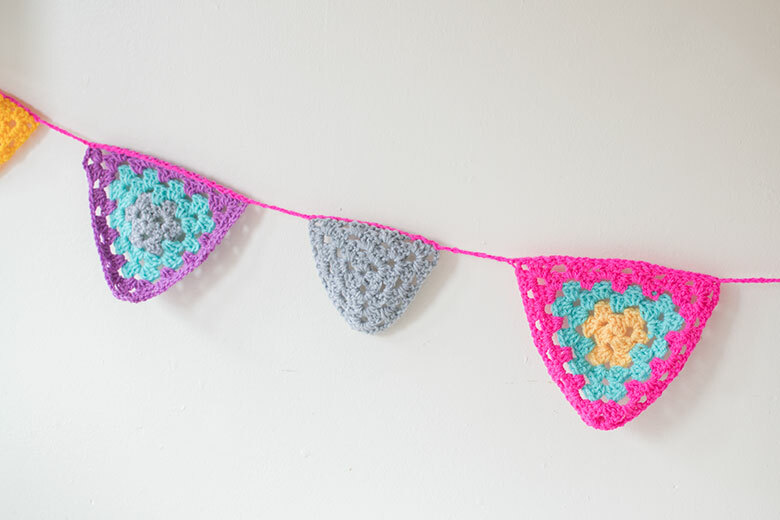 There are lots of ways you can make it, this is some crochet bunting that I made earlier in the year. If you can’t crochet then there are still lots of options whether it be sewing little triangles in the material of your choice or even using felt if you can’t sew. You could sew on the letters in a different colour felt to spell out your child’s name. You could also use seasonal bunting and change it every few months. How about this spooky doll bunting at Halloween and this Hama Bead ice-cream bunting in the summer? Stick up some of your children’s artwork. This is such a simple way to brighten up a room. You just find some washi tape that matches the colours in the room and stick up lots of your child’s drawings. You could cover the entire wall if you needed to, this would be a good way to disguise any horrible colour paint or wallpaper. Wall stickers. Room To Grow have four sets of wall stickers for your children’s bedroom walls and the best part is it’s absolutely FREE to download. It comes with full instructions on how to print it and the different methods. It comes in four designs, Tiger would absolutely LOVE the road one as he is obsessed with cars. You can find out more about them HERE. Put some shelves up. Putting up shelves and filling them with toys and bright things can make a huge difference to a wall. You can see a great example of this over on Katie’s blog. I’ve never really bothered doing much decorating in the house where we are living at the moment as we don’t plan to be here for very long but I’m looking forward to eventually making somewhere feel like ours by putting lots of personal touches to the property. Obviously if you have just bought just house or you hate the colour of your walls then painting is a great option, you can check out this post about how to paint a room without making any mess and if you wanted to avoid painting walls but give another part of your home a freshen up then painting your kitchen cabinets is a great idea, we’ve actually done that in our house. This post gives you some great advice about how to do that – how to paint kitchen cabinets.